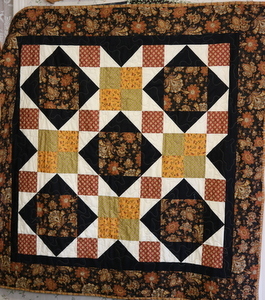 This quilt is offered with blacks, golds, rusts and beige. The prints on this new line of fabric stand out very much in this quilt pattern. This pattern needs a fabric that can stand center stage and this grouping certainly does just that. This is a 4 week class offering and can be made with other fabrics as well….a good beginner project.